Game now defaults to using OpenGL Core when DirectX 11 is not supported by system hardware. Please see the release notes for more info. This release addresses a regression in the previous release. Mouse cursor is now shown when the game loses focus while on the Pause Menu. This release introduces a number of fixes and improvements to the previous release. NOTE: Due to changes made to the game save system, all save data will be reset on first load. Custom settings are now applied on load. Mouse cursor is now shown when the game loses focus. Configuration window is now shown by default on load. Default quality level is initially set to Good instead of Maxed Out on first load. Quality levels are limited to Good, Beautiful, Fantastic, and Maxed Out in increasing quality. Graphics settings found in the Pause Menu are now disabled by default on first load. Added Graphics API support for OpenGL Core and DirectX 12. Due to the current experimental nature of DirectX 12 in Unity, DirectX 11 still has priority and will be used by default if supported by the graphics card. DirectX 12 can enabled by using the command line argument -force-d3d12. At the very least, graphics cards must support DirectX 11, or OpenGL 4.1 or newer. General improvements to UI and menus. General improvements to saving game state. General code refactoring, project reorganization, and cleanup. Replaced the existing game save system with a new system less prone to error. Added a version check and update notification prompt on app start. This is a hardware / graphics API issue. Version 0.1.0 only supports DirectX 11. The ATI Mobility Radeon HD 4670 card does not support DirectX 11, or OpenGL 4.1 or newer. With added support for OpenGL Core, I was able to resolve the issue with reflections, but the tree shader doesn't have a suitable fallback. Which resulted in them being drawn with an unlit white texture. This issue does not occur when using OpenGL 4.1 or newer. In addition to adding OpenGL Core in the next release, support for DirectX 12 will be added as well. Setting to Uncompressed did not resolve the issue. This appears to be a driver issue, specific to the hardware and driver version listed in the report. Which may not fully support DirectX 11. Was able to resolve the issue by forcing the use of OpenGL Core, but not without causing new issues. Continuing to research a solution. I've noticed there are a few issues with this build. Settings aren't applied on next load. Reflective surfaces appear pink and blue on some hardware. Initial performance is likely poor due to default quality and settings being maxed out. I'm going to be addressing these issues in an upcoming v0.1.1 patch release. To help improve performance on first load, I will be lowering the default quality level and making the Configuration window visible by default. 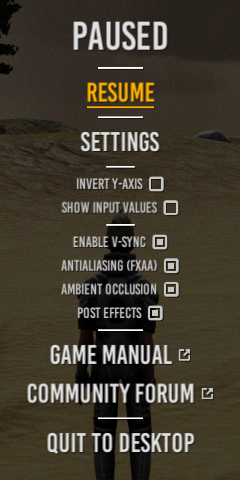 Will also be disabling FXAA, Ambient Occlusion, and Post Effects by default under the Pause Menu. Will aim to address a couple other issues as well that didn't make it into the first release. Release notes will be available in an update anouncement. Issue is not hardware specific. Issue may be due to reflection probe compression. Changes to settings in the Pause Menu aren't applied on next load. The user disables the Post Effects option. Observes film grain and motion blur when moving. Opens the Pause Menu to observe settings. The setting appears to be applied after closing the Pause Menu. 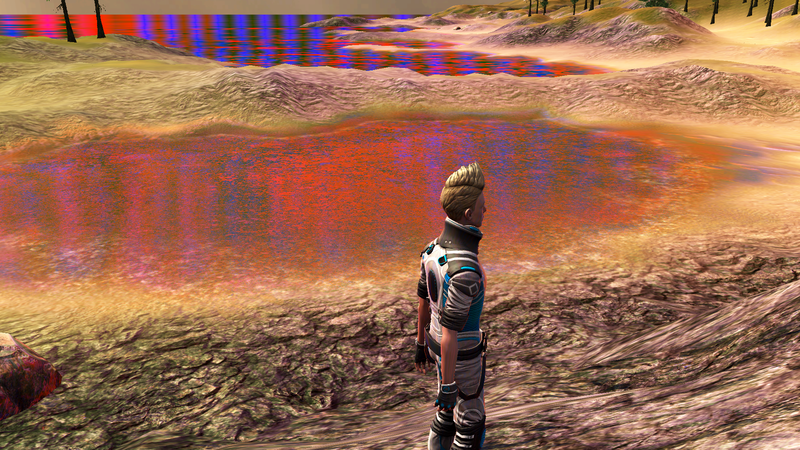 Reflective surfaces appear discolored, pink with blue banding -- most notably with water and rocks. The first release of The Island Project is now live. This manual outlines the inputs, options, and settings available in The Island Project (v0.1.2). Due to COPPA regulations, you must be at least 13 years of age to play The Island Project. Please be aware that builds are not yet optimized. Performance may suffer on older or lower-end PCs. Due to the current state of development, The Island Project only supports Windows 64-bit PCs at this time. Support for additional platforms will become available after the project has been optimized and tested for those platforms. Please note, there is at least one reported issue with ATI graphics cards. 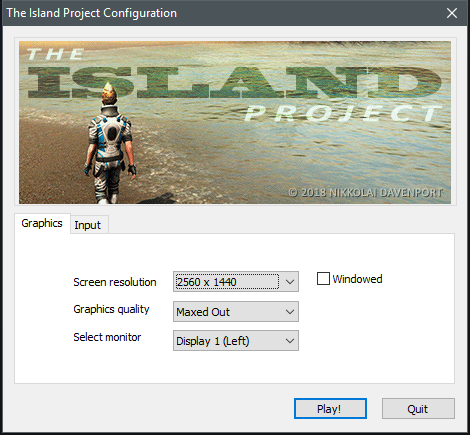 The Island Project has not yet been sufficiently tested for use with ATI or Intel based hardware graphics acceleration. 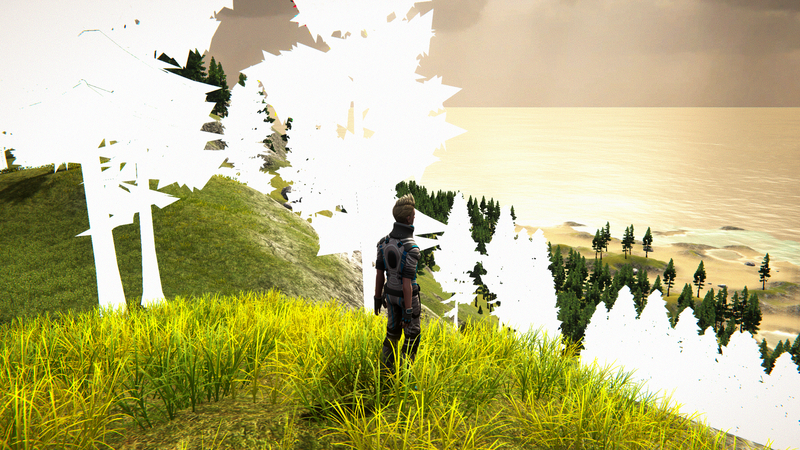 The Island Project currently supports DirectX 11, DirectX 12, and OpenGL Core. Due to the current experimental nature of DirectX 12 in Unity, DirectX 11 still has priority and will be used by default if supported by the graphics card. DirectX 12 can enabled by using the command line argument -force-d3d12. At the very least, graphics cards must support DirectX 11, or OpenGL 4.1 or newer. Support for DirectX 9 has been deprecated by Unity, and therefore will not be supported. The Island Project supports input from Keyboard, Mouse, and X-input compatible controllers. Input mappings can also be viewed under the Inputs tab of the Configuration window. The Configuration window is now shown by default. This window provides you with options to set screen resolution, graphics quality level, the monitor to use in a multi-monitor setup, and whether to run the game in windowed or full-screen mode. Additional graphics settings can be found in the Pause Menu. The Pause Menu can be raised by pressing the Escape key or Start button using an X-input controller. Inverts the vertical look-axis controls for the player camera. Enables the in-game Input Debugger overlay. Sets the vertical sync count to 1 when enabled. Enable to prevent screen tearing artifacts. Enables Fast Approximate Anti-aliasing (FXAA) as a post-processing effect. Disabling may improve performance. Enables ambient occlusion as a post-processing effect. Disabling may improve performance. Enables additional post-processing effects such as motion blur, bloom, chromatic aberration, grain, and vignette. Disabling may improve performance. Note that the color grading post-processing effect remains enabled even while the Post Effects option is disabled. This is because it plays a significant role in setting the overall visual tone of the project. Links to this page in the itch.io Community forum. Links to the itch.io Community forum for The Island Project. In addition to Unity Standalone Player command line arguments, The Island Project has a few of its own. Resets the player start position to the original starting position. Resets all settings, including changes made to the Configuration window. Resets player stats and progression data. Resets all settings, player stats, and progression data. This restores the game to its original state. The Island Project was developed by Nikkolai Davenport. The albedo texture for Ethan comes from the Stealth (Unity 4.x) sample project. Made with Unity. Portions of this program © 2005 - 2018 Unity Technologies. "Unity" and associated logos are trademarks of Unity Technologies. The Island Project. © 2018 Nikkolai Davenport. All rights reserved. Looks like the Alpha was taken down in preparation for an updated version, but this was mentioned in a post from June. More details on ModDB.